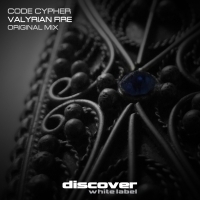 Haunting and hypnotic from the start, Valyrian Fire, the exciting label debut from Code Cypher moves effortlessly into an ethereal feel with the addition of some gorgeous vocal ad libs. Guitar plucks add to the breakdown for a track that as it opens into all of its sonic purity takes an unexpected turn after the breakdown into harder territory. Originality is key here - easier to talk about than execute - but Code Cypher has excecuted it to perfection. 'Valyrian Fire' is available now from Beatport and iTunes.